The LP Tank Truck is finally an easy answer to lifting, storing and transporting problems associated with LP tanks. 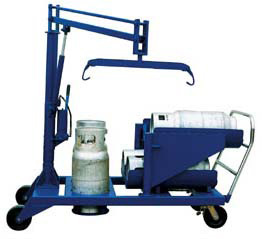 This all-in-one cart will allow the user to transport LP tanks to the location they are needed. The built-in crane can be used to safely load full tanks into fork trucks. The crane pivots 360° for maximum versatility. The crane boom is raised and lowered with a manual hand pump hydraulic lift. The tank attachment at the end of the boom automatically clamps to each end of the cylinder. The built-in racks are ideal for LP tank storage -- stores two tanks in the vertical position and four tanks in the horizontal position. Each unit includes a push handle with two rigid and two swivel casters for easy portability. Heavy-duty welded steel construction with a painted finish. Specs: Storage Capacity - 6 tanks; Overall Size - 33"W x 80"L x 73"H; Casters - Phenolic 8" x 2".